The Hale Family Visits the Land Down Under: Day 10 – Road Trip! Day 10 – Road Trip! 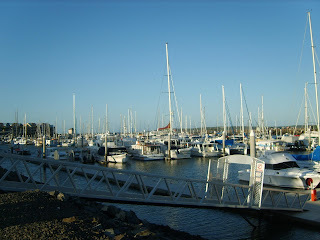 The weekend is here and we got out Gladstone to go site seeing to the South. We first stopped off at Agnes Waters, which is a very quaint little town with great beaches. We didn’t spend too much time there, just enough to grab lunch and walk around to see the site. We also drove through a town called 1770. That’s correct; it’s a number not a name. Apparently it was named after the time when Australia was being settled. We headed South some more headed towards Frazer Island. This was quite the interesting drive, since this was my time to try driving. I picked up most of it watching my dad drive around, but watching and doing are very different! I have to admit I did very well for myself, driving on the other side of the road on the wrong side of the vehicle. I think the worst part is trying to figure out the turn signals. Due to this confusion, our windshield never looked so clean. While driving, we did get to see some “Roos” in the wild, a big group on someone’s farm. It was a great site to see! 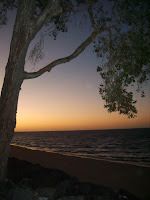 After a four hour drive we made it to Hervey Bay where we’ll set off tomorrow morning at 7am to go to Frazer Island. We have a great place to stay here. It’s a two bedroom apartment that looks to the ocean, beach and very long pier. We did get to walk the beach before the sun had set. Not much to do once the sun sets here. Most of the shops here in Australia close after 6pm and many are not opened on Sundays. I have to admit, that’s quite nice, that is as long as you’re not a tourist. We’re still not too used to the time scheduled. We spent the last two hours forcing ourselves to stay up by playing card games, one of the family’s favorite past times. I’m sure I’ll be getting a lot of great photos tomorrow; I can’t wait to set sail on the reef!